The inspiration kit for this month's Counterfeit Kit Challenge was the rather delicious looking March Main Kit from Gossamer Blue! With no clear theme to the inspiration kit, I decided that I'd emulate it's eclectic mix - and tried to put together a kit full of colours, textures and patterns. I've ended up with a selection of 6x6 papers from Dear Lizzy, Echo Park and Studio Calico and a few additional 12x12 papers from Echo Park, American Crafts and We Are Memory Keepers. Combined with several sheets of neutral cardstock, I think I might be onto a winner! I've carried the eclectic, colourful theme on into my selection of embellishments and extras, with a wide selection of inks, spray inks, journalling cards and die-cuts. The cute, little flower cabachons were all in my beading stash - I was so thrilled to find a few that matched my paper selection so well. 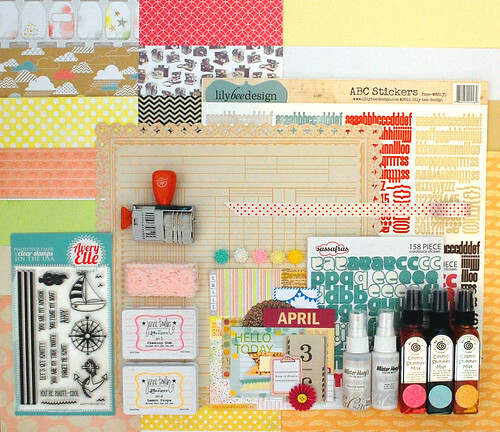 And, although it doesn't really 'match' any of my paper choices, I couldn't help including the Avery Elle 'Knotty Stamp Set. It's just so damn awesome! So, even though I know I 'should' work on my Project Life back-log (I'm still working on the beginning of February!) 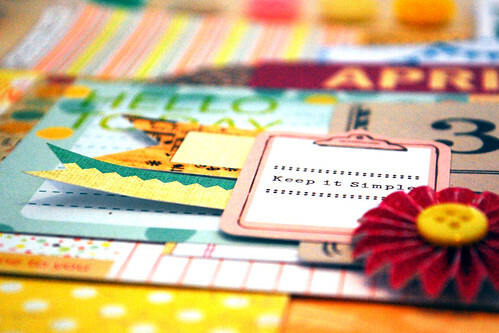 I'm craving cute, little mini-books and teeny, tiny cards. What will you be using your kit for? Your kit looks so bright and fun! Don't worry about the "should" and enjoy creating with your beautiful kit! Oh this looks fabulous - it's joining to be a very spritzy kind of month, I see. Amazing! I love all the super fun patterns in this kit of yours!!! Gorgeous kit (and beautifully photographed). Ohhhhh and ahhhhhhh! That is what I kept saying as I perused your fantastic kit! LOVE what you found and the clean and neat way you presented it! Very inspiring! Winning! and loving this...looks very professional and like something I'd buy from amother kit club (LOL)...love that you brightened it up-super love on the cameras and the cloud papers! I like the feel of your kit! Fabulous kit!! Love those little flowers you found! Lovin' that kraft cloud paper. Such a pleasing array of supplies. Hope you had fun with them this month.